Happy Valentine’s Day loves! I hope you’re all having a lovely day and have some fun plans, whether it’s a special night with your partner, drinks with the girls or just ignoring the whole thing and celebrating the weekend instead! Unfortunately, I’ve come down with a totally gross cold/flu thing, so the only hot date tonight for me will be with tissues and Lemsip – crazy, I know. But in the spirit of spreading the love (not germs), I’ve got a super exciting giveaway for you guys. Adidas NEO invited me to showcase five key pieces from their new campaign, designed in collaboration with the beautiful Selena Gomez. It’s a great collection – urban, youthful and with touches of girliness, just as you’d expect from Selena. While I’d love to keep the pieces to myself, I thought it’d be nicer to hold a little giveaway and give you all a chance to swag the pieces for yourself. Please be aware that, as these items were sent to me to shoot for the blog, they’re all a UK size 8/10. Here is what’s up for grabs! I love that dress. It’s so cute!!!!! My favorite is that one with the little dress. The jacket is perfect. Gotta have it! I like you best in the floral dress! Love them all but outfit no. 4 gets my vote – you suit pink and grey! Oh, what an amazing giveaway my dear, loving ALL of the looks, you are amazing! ♥ Happy Valentine’s day and thanks for the opportunity! 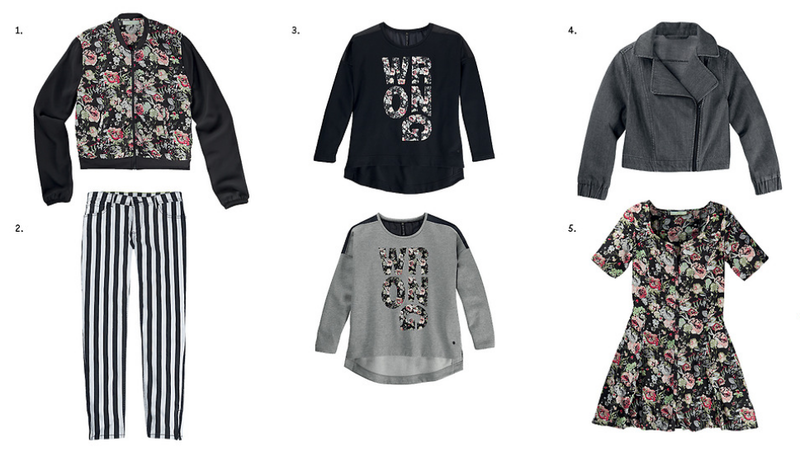 I LOVE the 3rd one(the dress with the bomber jacket) and the 4th one (with the wedge trainers and cute sweater!) I think i have fallen in love with the whole collection though! i abs love ur pants!!! xO! I love the dress and I love how you styled it! I like the floral print dress the best #5, and the shoes that you wore with it. Is this open to Canada? My fav is that gorg little dress! I love the second but all are so amazing!!! I loved the black floral jacket & the floral dress. They look so pretty! I loooooove the flower jacket and the grey sweatshirt!! My fave! Just love how you mixed the sets! I really love the floral dress, and I love how you styled it, you look so pretty! I just loooooove number 1,3 and 4. They are like my style and I’ve tryed to WIN on adidasneolabel on Twitter and I didn’t won anything even tho I were in all the contests to I thought I could try if I won anything here on your fabulous blog! Omgg I only have 3 SHOES from her collection (not her new one) but nothing from her clothing line because its pretty EXPENSIVE so this is like my chance to WIN something from Selenas clothing line. So I hope I have a chance! Lovveeeee the flower jacket with the skirt! It looks so great at you!!! I love the flower jacket!!! I like the second look. This look is so amazing and beautiful and you are so beautiful OMG. I love #4 and #5 the most there awesome! This is a really hard question, because I loved loads of these! But my favourite is the one with Selena’s jacket! It was so beautiful and the clothes you matched it with just goes so well! And you did such a simply hair style but I looked so pretty and gorgeous! Love the dress. It’s adorable and also the gray coat. So classic! I love the floral print dress!!! I really like all the looks, but I think you literally rocked the jacket! I would loooove to WIN 1,3 or 4 because they are exacly my style and I just love the design in these three! I’ve tryed and tryed to WIN selenas clothes but never won and they are pretty EXPENSIVE WHERE I live so it would be awesome to WIN these clothes that I like. the dress is just great! I would love to choose 1,5 and 3 the grey one because they are so so my style and Adidas neo clothes don’t even come out in my country. I would die for this! Some great looks there, they all suit you. My favourite though is the last one in the dress. Ahahah lol I want them. That pants and the dress are going to be mine** btw I love your all posts. What can I say? IM A FAN LOL. I like the dress best. omh i loove everything!!! soo cutee! i want that dreess and the jacket! im in love!! I love the floral dress outfit!! I’m all about florals right now! Also your scarf in the first picture is pretty awesome! I like the second one down. The last one is my favorite but I love all of the looks! I love the forth outrit- cute and girly grey+pink! The last one with the dress. All your images look great but the pink dress with the charcoal jacket looks amazing! My favourite look is the last one with the flower dress with the pink purse it looks so cute! ooh i love the first look, those jeans are amazing! My wife would love all these items. The fourth outfit, with pink skirt. The flowery skater/tea dress is gorgeous! i LOVE the flowery jacket! is this contest open for belgium ? It’s open worldwide 🙂 winner announced in two weeks. OMG i follow your blog allready and i like you ! The flowery dress with heels. You look amazing in every single one of these pieces Natasha! Lucky me I’m a size 8/10 😉 You could look great in anything! Loved the outfit with the pink skirt!! I absolutely adore the floral dress! I love the cute floral dress! Perfect for spring but could also be worn in winter if layered right! I JUST LOVE IT ALL! Absolutely love the first look! Thanks for holding the giveaway! I luv every outfit you wear but those are my favourites!! I love the first look, for sure. You are so cute! the first one is gorgeous! I love the 4th pic with the gray sweater and pink skirt. I really like black and white vertical striped pants. They are even better with the black and white trend being in style right now. Vertical stripes make the legs look longer, plus black and white is classic, and will go with many things. I like the last look! THANK U SO MUCH FOR THIS CHANCE!!!! I really hope SO MUCH that I could win! You first look is simply breathtaking ;w;!!! But overall all of them are very cool *.*! I’m a SELENATOR 4 LIFE! I LOVE ALL OF THOSE CLOTHES! And that style! Oh my! My favourite look is the last one, that dress is so cute! the last look with the dress because it suits my style and is modest . I Love your Photos and this Collection. ❤❤❤❤ I want to win all of it, because I have no Money to buy me something. I HAVEN’T SEEN SOME COOL CLOTHES LIKE THIS. I love the outfit with the dress – the heels and socks work so well with it! I love the 2 and 4 the most I think! The jacket in number 2 is gorgeous! I love the first look because it is effortlessly chic. Thanks for the chance to win. Oh my! I’m in love with those clothes! Can’t stop thinking about them! Love the one with lace skirt! I love how it looks so sweet and casual! I love the dress but the overall look I like best is the black and white leggings and scarf. I love the one with the pink skirt and sweatshirt, it looks so laidback and chic at the same time. No 2 for me. I love those trousers. I love No.3 in grey – it’s so me!!! My favorite is that one with the little dress!!!!!!!! I’V BEEN TWEETING ABOUT THE #SELENANEOGIVEAWAY A LOT BECUASE I WONT TO WIN. You look amazing in the floral dress. The first and second look definitely. Although, I think that pink skirt is so cute! Enter @girlinthelens and @adidasNEOlabel’s giveaway to win 5 pieces from the new Selena Gomez NEO collection! I think I like the second outfit with the sweaters most because these are auch so cute and awesome! And you can wear them with anything! I love look number 5 the most. I’m all about cute floral dresses & I’m loving the socks & strapy shoes style. Def loving the 3rd look with the burgundy dress, very girly. Gorgeous clothing line, would love to win! I love your look in the Black floral dress. My favourite look is,the floral jacket the pants and the vest. I really hope I could win please! I’m thinking about this all the time! I’ld be so SO happy! Because I’ve never won anything before so I’ld be glad that the first thing that I’ve ever won were those clothes! Thank u so much for this chance! The floral dress, looks lovely. love the floral bomber jacket with lace skirt look! I love the pretty floral dress! The floral dress with the cute little satchel bag….the shoes and socks look awesome too!! The first one, I absolutely love those trousers!! I Hope I win the clothes, becausr I have no money to buy them myself and I love selena ❤❤❤ GirlInTheLens is the Best ! I love all clothes from Selena’s new collection. Love,Love,Love this clothes,i wont them. this clothes are absolutely amazing.I must have them. the flowery dress in the last shot is my fav, it’s so cute! I love that floral dress, it really suits you, and I want it badly!! love the tartan scarf look! I love the floral jumper. the bottom one, very pretty! Please I keep hoping that I’ld win! Thanks Cuttie for this chance I’ve really loved it! Love the sweatshirt look, but then again I’m lusting after that sweatshirt! The last picture – flowery dress. Looks beautiful. I love the look in the last photo. The burgundy dress is gorgeous! I love the first look, with the floral jacket and blue skirt, so pretty! The Second one, but they are all lovely. so when is the winner gonna be announced?? I so hope its me!! cant wait!! Sorry to those who didn’t win but thank you for entering and hopefully we’ll have another giveaway very soon!